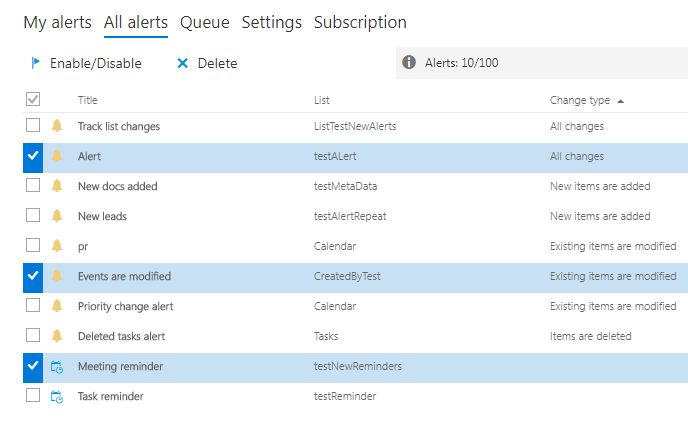 When the list of alerts subscriptions is too large to find a required item, you can use filter by column. For example, you can apply filter by change type. You can enable/disable created alerts by checking alert boxes and clicking “Enabled/disabled” button. The current status of an alert or reminder is displayed on the right side. If the status mark is highlighted green, this alert/reminder is enabled. Also, you are able to edit or delete created alerts by clicking on the corresponding symbol.